Uehara T, Minematsu K: Guidelines for management of patients with transient ischemic attack. TIA as Acute Cerebrovascular Syndrome, Uchiyama S, Amarenco P, Minematsu K, Wong KSL (eds), Karger, Basel: 103-114, 2014. 上原敏志: 一過性虚血発作. 脳梗塞診療読本, 豊田一則（編）, 中外医学社, 東京: 294-309, 2014. 上原敏志: 一過性脳虚血発作と急性脳血管症候群. 脳血管障害の急性期マネジメント, 橋本信夫（監）, 清水宏明（編）,文光堂,東京: 127-131, 2014. Nakajima M, Hirano T, Naritomi H, Minematsu K ：Symptom progression or fluctuation in transient ischemic attack patients predicts subsequent stroke. Cerebrovasc Dis:29 221-227. 2010. 上原敏志, 峰松一夫：日本脳卒中学会認定研修教育病院を対象とした一過性脳虚血発作(TIA)の診療に関するアンケート調査. 脳卒中 32： 710 - 718. 2010. Hoshino T, Mizuno S, Shimizu S et al. ：Clinical features and functional outcome of stroke subsequent to transient ischemic attack. J Stroke Cerebrovasc Dis: 22 310-316, 2011. Miyagi T, Uehara T, Kimura K, et al. ：Examination Timing and Lesion Patterns in Diffusion-Weighted Magnetic Resonance Imaging of Patients with classically defined Transient Ischemic Attack. J Stroke Cerebrovasc Dis 2013. Kobayashi J, Uehara T, Toyoda K, et al. ：Clinical significance of fluid-attenuated inversion recovery vascular hyperintensities in TIA Stroke 44 1635-1640. 2013. Uehara T, Kimura K, Okada Y, Hasegawa Y, Tanahashi N, Suzuki A, Takagi S, Nakagawara J, Arii K, Nagahiro S, Ogasawara K, Nagao T, Uchiyama S, Matsumoto M, Iihara K, Minematsu K: Factors associated with onset-to-door time in patients with transient ischemic attack admitted to stroke centers. Stroke. 45: 611-613, 2014. Suzuki R, Uehara T, Ohara T, Kawabata K, Yasui K, Hasegawa Y, Minematsu K: A questionnaire survey of general practitioners in Japan in relation to management of transient ischemic attack. Int J Stroke, 9: E16-E17, 2014. Tanaka K, Uehara T, Kimura K, Okada Y, Hasegawa Y, Tanahashi N, Suzuki A, Takagi S, Nakagawara J, Arii K, Nagahiro S, Ogasawara K, Nagao T, Uchiyama S, Matsumoto M, Iihara K, Toyoda K, Minematsu K: Features of patients with transient monocular blindness: A multicenter retrospective study in Japan. J Stroke Cerebrovasc Dis, 23: e151-e155, 2014. Fujinami J, Uehara T, Kimura K, Okada Y, Hasegawa Y, Tanahashi N, Suzuki A, Takagi S, Nakagawara J, Arii K, Nagahiro S, Ogasawara K, Nagao T, Uchiyama S, Matsumoto M, Iihara K, Minematsu K: Incidence and predictors of ischemic stroke events during hospitalization in patients with transient ischemic attack. Cerebrovasc Dis, 37: 330-335, 2014. Suzuki R, Uehara T, Ohara T, Kawabata K, Yasui K, Hasegawa Y, Minematsu K: Transient ischemic attack clinic in an urban area of Japan. Int J Stroke. 10: E43, 2015. Ohara T, Uehara T, Toyoda K, Suzuki R, Sato S, Nagatsuka K, Minematsu K: Early Stroke Risk after Transient Ischemic Attack in Patients Without Large-Artery Disease or Atrial Fibrillation. J Stroke Cerebrovasc Dis. 24: 1656-1661, 2015. Hama Y, Uehara T, Ohara T, Kimura K, Okada Y, Hasegawa Y, Tanahashi N, Suzuki A, Takagi S, Nakagawara J, Arii K, Nagahiro S, Ogasawara K, Nagao T, Uchiyama S, Matsumoto M, Iihara K,Toyoda K, Minematsu K: Clinical characteristics of transient ischemic attack patients with atrial fibrillation: analysis of a multicenter retrospective study. Cerebrovasc Dis EXTRA. 5: 80-90, 2015. 上原敏志, 峰松一夫: わが国におけるTIAレジストリーの現況. 脳卒中 37:197-201, 2015. 上原敏志: 一過性脳虚血発作の概念. 日本臨床, 72（増刊号7）: 266-269, 2014. 上原敏志, 峰松一夫: わが国におけるstroke unitの有効性. 総合リハビリテーション, 42: 205-210, 2014. 鈴木理恵子, 峰松一夫: TIAクリニック. Current Therapy, 32: 1199-1204. 2014. 上原敏志, 峰松一夫：TIAクリニック.Modern Physician 35; 647-651, 2015. 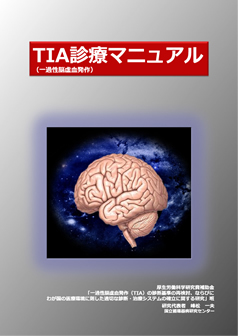 Copyright©2010 一過性脳虚血発作(TIA)の診断基準の再検討、ならびにわが国の医療環境に則した適切な診断・治療システムの確立に関する研究. All Rights Reserved.